What’s the most photographed statue in town? Nobody really knows, but if it’s not Abraham Lincoln at his memorial than it’s surely Andrew Jackson here in Lafayette Park. Why? First, it’s a great statue. Second, it’s right by the White House. Third, it’s a dynamite shot, especially at night with the White House as the backdrop. Our seventh president, Jackson is shown aboard his horse wearing the uniform as a major general of his Tennessee militia while reviewing his troops shortly before beating the British in the Battle of New Orleans in the last battle of the War of 1812. “Old Hickory’s” fiery temper is shown by his horse’s front two hooves raised, but Jackson has a snug grip on the reins while tipping his cap to the troops. The scar on Jackson’s face was from a British officer’s saber after refusing to shine the officer’s shoes during the Revolutionary War. There have been several attempts to move the statue, including one by president FDR, because other statues in Lafayette Park are of Revolutionary War generals. But Jackson beat the British, too, just in a different war. 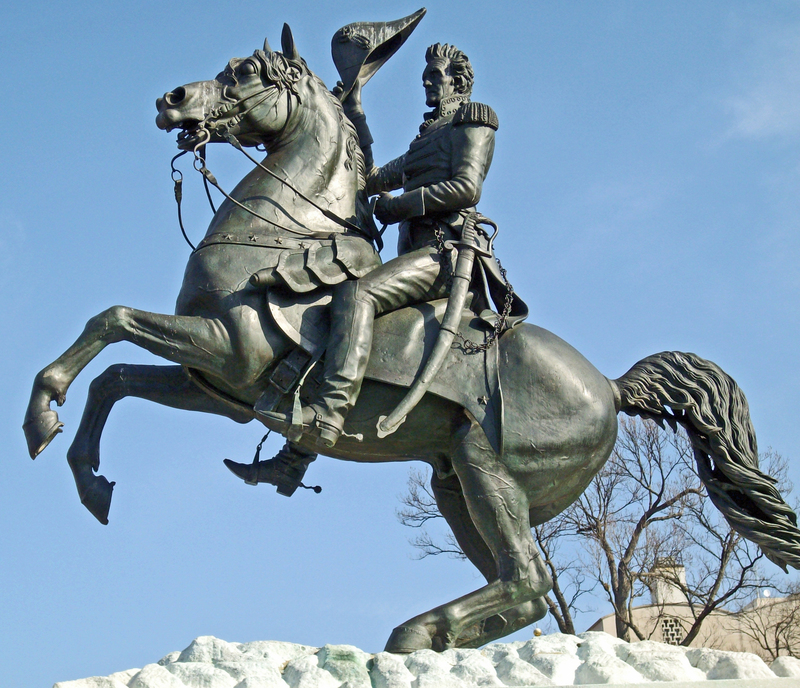 This is the first equestrian statue cast by an American. Clark Mills was the sculptor. Indeed, the foundry was at 15th and Pennsylvania Ave. N.W. 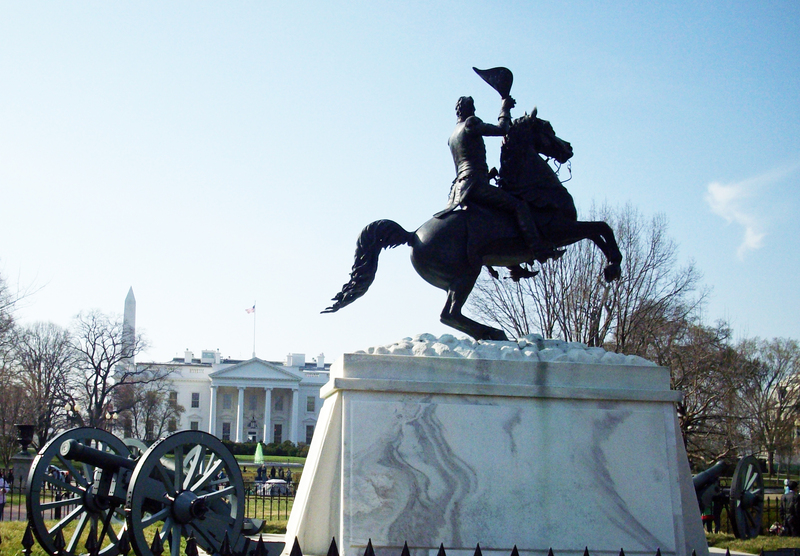 It was dedicated in 1853 with 20,000 people cheering Mills as he marched down Pennsylvania Ave. The statue is 9 feet high and 12 feet wide. This entry was posted in Monuments and Statues and tagged Andrew Jackson statue, Best Washington DC walking tours, Lafayette Park, Old Hickory, Photos by Rick Snider, Washington D.C.. Bookmark the permalink.